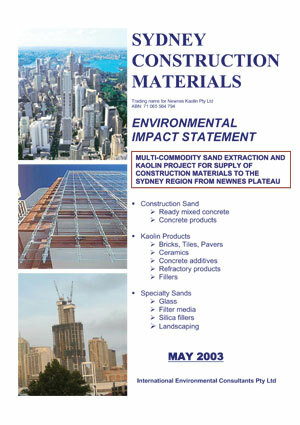 In July 2003, Sydney Construction Materials lodged a Development Application and accompanying Environmental Impact Statement (EIS) with the NSW Department of Infrastructure, Planning and Natural Resources (DIPNR) for the Newnes Junction Sand Extraction and Kaolin Mining Project. Use the links below to view the EIS. Alternatively, you can click here to download the entire EIS in one file (18,912 kB pdf).